Megas Limionas is the next beach in the row of Karfas and Agia Ermioni before Agia Fotini just before we enter the village of Thymiana and almost nine (9) kilometers from Chios town. 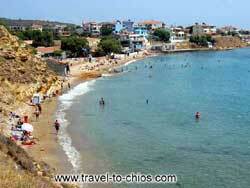 It is a very popular beach in the island, full of coarse sand and small pebbles. The crystal clear waters and the warm sun offers a great pleasure to the visitor.